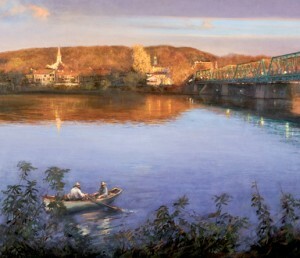 The Phillips’ Mill Art Exhibition has been the premier art show in the Delaware Valley since 1929. Founded by the legendary greats, William Lathrop, Edward Redfield, Daniel Garber and William Taylor, among others, the early shows were intended to display work for friends. Famous artists from the New Hope School and beyond soon began to exhibit on a regular basis. Today more than 350 painters and sculptors submit over 500 works of which about 95 framed pieces are juried into the exhibit. The exhibition has grown steadily in prestige and attracts thousands of visitors each year. This major exhibition invites artists who live within a 25-mile radius of the Mill to enter work for the show. In 2012 the jurors awarded 20 prizes, totaling $11,000. The show will run from Saturday, September 21 through Saturday October 26. 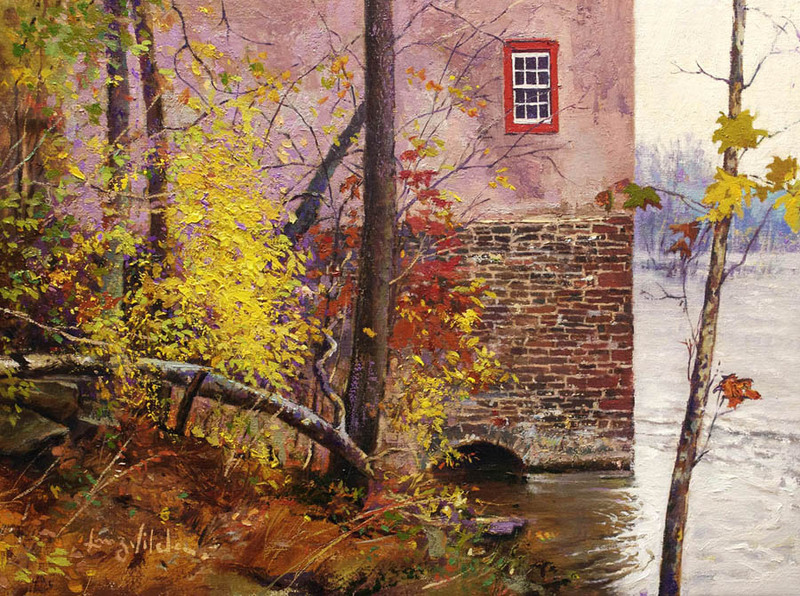 This is year my painting “The Phillips’ Mill” (above) was selected by the Art Committee for its 2013 campaign. “River Mist” (above) submitted into the juried show was selected and it will be featured at the exhibition, as well. My painting “The window at Stover Mill” will be on view at this juried exhibition which is sponsored by the Tinicum Civic Association and was juried by Janet Marsh Hunt, director for over 30 years of the former Coryell Gallery in Lambertville, NJ. The exhibit will be held Saturdays and Sundays beginning October 12 through November 3, 1-5pm. A gala opening reception will be held on Sunday, October 13, 1-5pm. Please invite your friends! The Gallery is located in a former gristmill, built by Henry S. Stover in 1832. The Stover Mill was placed on the National Register of Historic Places in 1979. 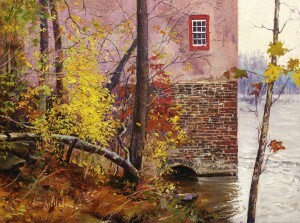 The Stover Mill Gallery opened in 1959 and is the oldest, continuously run art gallery in Upper Bucks County. It is owned and operated by the all-volunteer, 501(c)(3) non-profit Tinicum Civic Association. Gallery art shows change monthly and admission is always free. at 6:00 p.m. for a talk. I will be discussing how attending classes and workshops at Studio Incamminati enhanced my painting skills and was relevant to my art career. 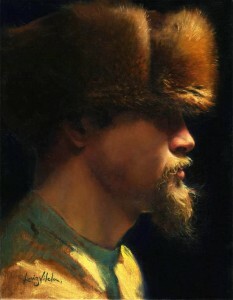 My painting “Fur-Portrait of Donald Becker” is a finalist from the ACOPAL Competition. The Top 100 Finalists from the ACOPAL (THE AMERICA CHINA OIL PAINTING ARTISTS LEAGUE) Competition are now posted on the website. Three Grand Prize Winners will be notified on or before May 30th. 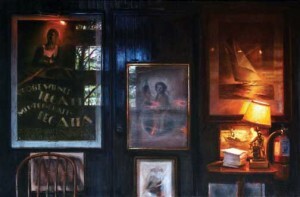 A minha pintura “Pele-Retrato de Donald Becker” é uma das finalistas do Concurso ACOPAL. Os 100 finalistas da competição ACOPAL (CHINA AMERICA LIGA DE ARTISTAS DE PINTURA A ÓLEO) estão publicadas no site. Os três vencedores do Grande Prêmio Grand serão notificados até 30 de maio. Here is my poster for this year festival. Sunday, May 1 at 3pm at the First Presbyterian Church, Union Street. Proceeds benefit the Scholarship Fund. It’s all about the fish at shad fest 2011. 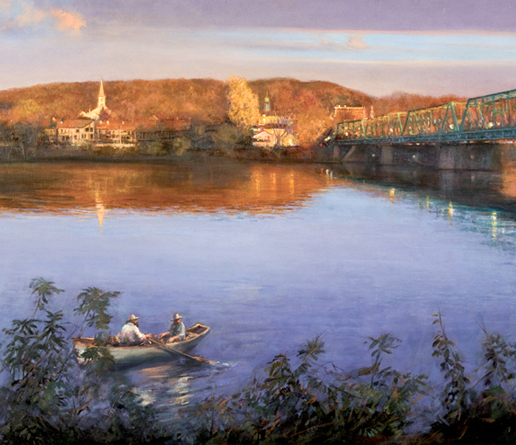 The festival, timed to coincide with the heart of the American shad run up the Delaware River, lures folks who travel from all over the United States to enjoy the beautiful setting, the flea market, and delicious foods-including barbecued shad. The SHADFEST (shad fest, shad festival) art scholarship fund poster auction is a small part of the award winning two day event that typically happens the last full weekend of April every year and has been for 30 years. This year because Easter is late the event is pushed to April 30/May 1. SHADFEST 2011 is a huge street fair in downtown Lambertville, NJ. Enjoy arts & crafts, live music, kid’s activities, historic shad hauling demonstrations, an amazing food court, limited edition commemorative T-shirts and lots more. O meu poster para o Shad Festival este ano, em Lambertville, NJ. Os posters serão leiloados no domingo, dia primeiro de Maio, às 3 da tarde na Primeira Igreja Presbiteriana, na rua Union. Os rendimentos do leilão beneficiam o fundo de bolsas para estudantes de arte. O Shad é um peixe que passa a maior parte de sua vida no mar, mas nada rio acima para desovar. O festival em Lambertville, que atrai gente do todo o país, é planejado para coincidir com a desova no rio Delaware, que banha a cidade. O SHADFEST (festival do Shad) leilão de posters é uma pequena parte dos dois dias do evento que normalmente acontece no último fim de semana de abril, anualmente, e tem acontecido há 30 anos. Em 2011, porque a Páscoa é mais tarde, o evento foi empurrado para abril 30/maio 1. O evento, shadfest 2011, é uma feira de rua enorme no meio de Lambertville, NJ. Aproveite para ver artes e artesanato, música ao vivo, atividades infantis, demonstrações sobre a história do festival, praça de alimentação, camisetas do festival em tiragem limitada e muito mais. 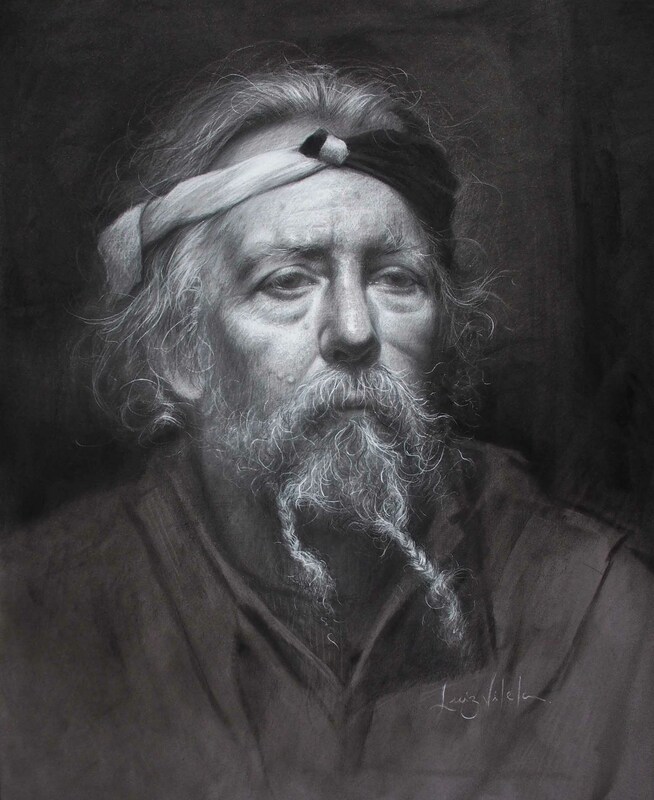 Luiz Vilela’s painting “Fur – Portrait of Donald Becker” is going to be be featured at Phillips’ Mill 81st Annual Juried Art Exhibition this fall. 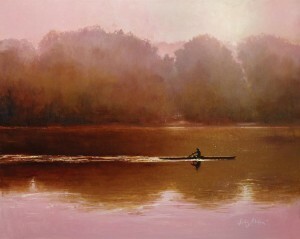 Phillips’ Mill 81st Annual Juried Art Exhibition will open its’ doors to the public on Saturday, September 25 and run through Saturday, October 30, 2010. The show is open daily from 1-5pm. Adults – $4, Seniors – $3, Students – $2. The Exhibition is held at the Historic Phillips’ Mill, 2619 River Rd. 1 1/2 miles north of New Hope, PA. For information call 215-862-0582. Through dreamy riverscapes, local landscapes, portraits, or empty rooms full of emotion, Luiz Vilela is creating some of the most compelling images of the Delaware Valley area seen today. In his recent works on view this fall at desChamps Gallery in Lambertville, Vilela’s work offers a powerful range of mood and color, in both bold and delicate combinations. Working to achieve accurate representation without too much idealization the artist is conscious of his mind insights and the power of observation. Luiz’s paintings, watercolors and drawings have been exhibited in galleries in Bucks and Hunterdon Counties, and New York City. His paintings have won awards in several art shows including “The Lambertville And The Surrounding Area Exhibition,” at Coryell Gallery, in Lambertville, NJ; “The Phillips’ Mill Show,” in New Hope, PA; and “79th Annual Exhibition of the Hudson Valley Art Association” at The National Arts Club, New York City. Luiz Vilela is a member of Portrait Society of America, and the Artsbridge’s group in the Delaware Valley.